Last week we introduced the Analytics Accelerator which is part of the CRM Accelerators for Microsoft Dynamics CRM customers and partners to be released in the next few months, each week we will unveil more details of each accelerator. In this article we feature the eService Accelerator. 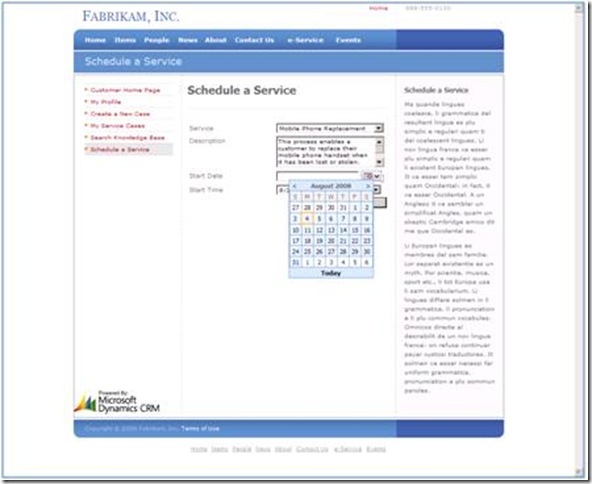 The eService accelerator provides businesses the ability to deliver self-service capabilities to their customers while tracking and managing these interactions in Microsoft Dynamics CRM. Customer Service is generally considered a cost center where cost-savings and productivity are the top priorities for most businesses. This stands in stark contrast to marketing and sales which is usually viewed as a profit center where revenue generation is the focus. People that manage call centers or customer service operations are constantly looking for new processes and technologies that can help them drive customer service efficiencies. Essentially, they want to service more customers at less cost while at the same time maintaining (or even improving) customer satisfaction. This can be a difficult equation for organizations to solve. eService provides the mechanism to help businesses solve that difficult equation. At its core, eService is comprised of a range of technologies that allow businesses to provide online support to customers, which can “deflect” calls and in-person visits, or at minimum reduce a portion of the cost to manage a service issue. As demographics shift worldwide and Internet technologies become more pervasive, many customers prefer to use an eService channel. Customer authentication into the portal and workflows to manage the setup of a contact as a web self-service customer. 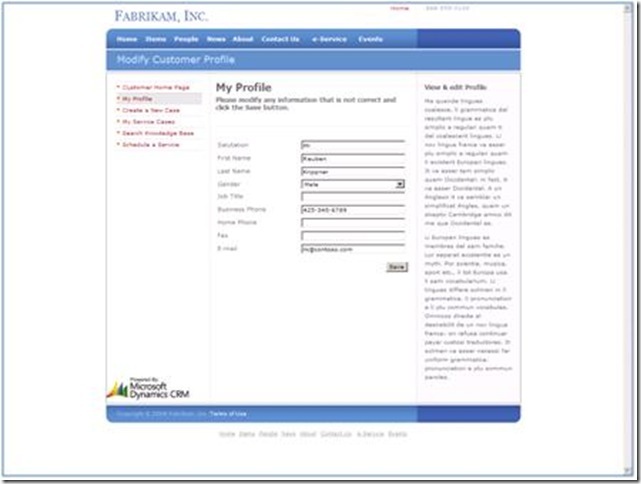 Customer profile updates to contact details; this capability is configurable allowing organizations to choose which attributes of the profile they want to expose to the customer portal such as name, contact details and communications preferences. Account-Level: these customers can view and modify all cases raised against the account they are associated with. Contact-Level: these customers can only view and modify service cases that they themselves have raised. Online service scheduling allowing customers to search for convenient times and then book service appointments with the organization. 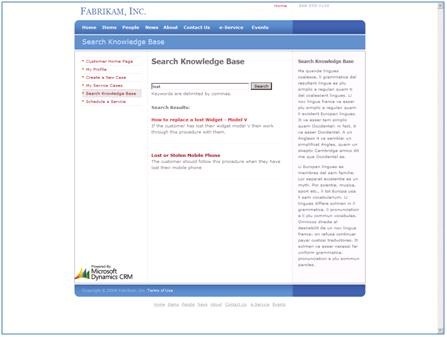 Search against the Microsoft Dynamics CRM knowledge base (KB) using keywords. 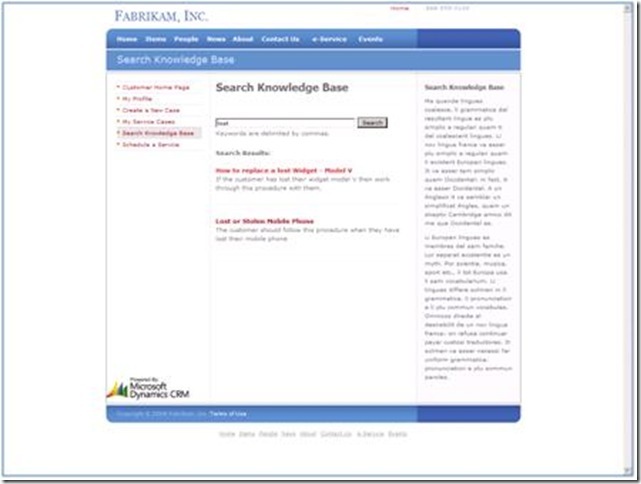 Once the appropriate KB article has been located the customer can then email that article to themselves or others. The accelerator can either be used within the customer’s own web portal or they can use the pre-built portal solution provided by Microsoft in the ASP.NET 2.0 Small Business Starter Kit http://www.asp.net/downloads/starter-kits/small-business/. All source code from the customer portal solution is provided so that customers and partners can extend the solution further and tailor it to their specific business requirements.